Some of this information, in general, may apply to other breed registries. Female – as opposed to male. 🙂 Also note, the animal may be a TWIN. Twin = Male-Male twins OR female-female twins are usually okay, with one being more dominant/strong and one being weaker. 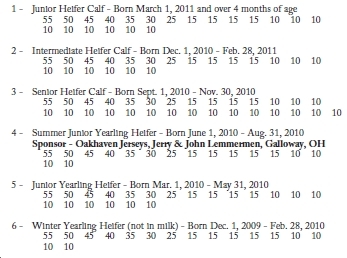 Male-female twins will most likely produce a freemartin, which means the female does not have all her female parts, therefore cannot have babies/produce milk. Basically, they are a steer at birth, though from the outside you may see all signs that she is a female. Twinning can cause complications at birth and harm the cow, so better to avoid if possible. Embryo Transfer (“-ET”) – Animal was born from a “surrogate mother” and “Parentage Verified” shows that DNA analysis proved the correct parentage. “Queen-Acres” – is the name of the FARM that BRED/OWNED the cow originally. If Queen-Acres was at the END of the name, the farm likely bought the mother of the cow and the cow was born at the farm, though not bred by the farm. “Blaze” – Generally, after the farm name is the short name of the SIRE. 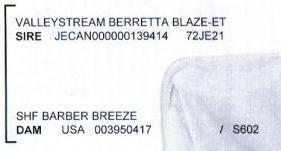 Blaze is short for Valleystream Beretta Blaze-ET, and most farms follow this rule, which allows other dairy farmers to instantly know who the sire of any animal is. This is very helpful to compare heifers and cows from different genetics, to know whether or not the bull is a good sire! “Windy” – The name of the cow. Many farms (sorry, not this cow) like to keep one letter of the alphabet for a particular cow family. For example, my first cow was ROSE. So, her descendants are: Rosebud, Rosalie, Rosalind, Rosie, Ruby, Rosemary, Rizelle, etc. This way a farmer can keep track of which family the cows are from on the maternal side. Tattoo: Required for individual identification. QA = Queen-Acres, 979 is that cow’s individual number from the whole herd. The tattoo shows up as QA979/QA979 meaning she has a tattoo in BOTH ears. 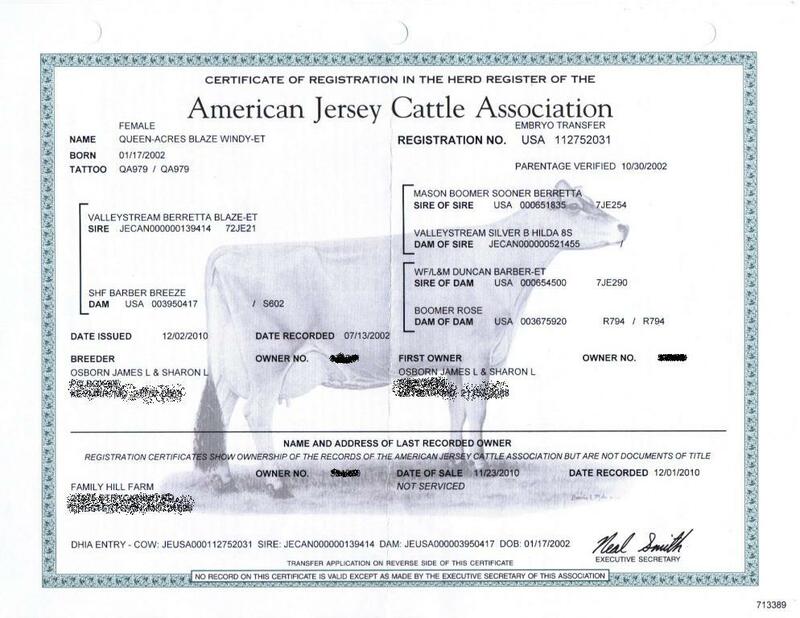 If the paperwork showed _______/QA979, it would mean the tattoo was only in the cow’s LEFT ear. QA979/______ would then imply a herd tattoo in only the cow’s RIGHT ear. Note, Brucellosis vaccination is often marked in the right ear via tattoo and is not animal-specific for identification purposes. If the animal has a metal tag in the ear, this can help track the animal’s identity. “Registration Number” is individual to that animal. If you ever transfer an animal or that animal has a calf you want to register, or if you set up DHIA records or need to talk to someone about the cow, that is the number they need. NOTE: Under “Date of Sale” – This is the official date the animal changed ownership. If showing a heifer, make sure you look up show regulations on when the animal needs to be in your ownership or you may not be able to show! “Not Serviced” – Means the cow was either sold open or no service information was noted when the transfer was processed by the seller. In this cow’s case, she was sold as bred to a bull, but the previous owner (After Queen-Acres, but before us) had never gotten registration information on the bull. So, we just had no information to put on the paperwork. 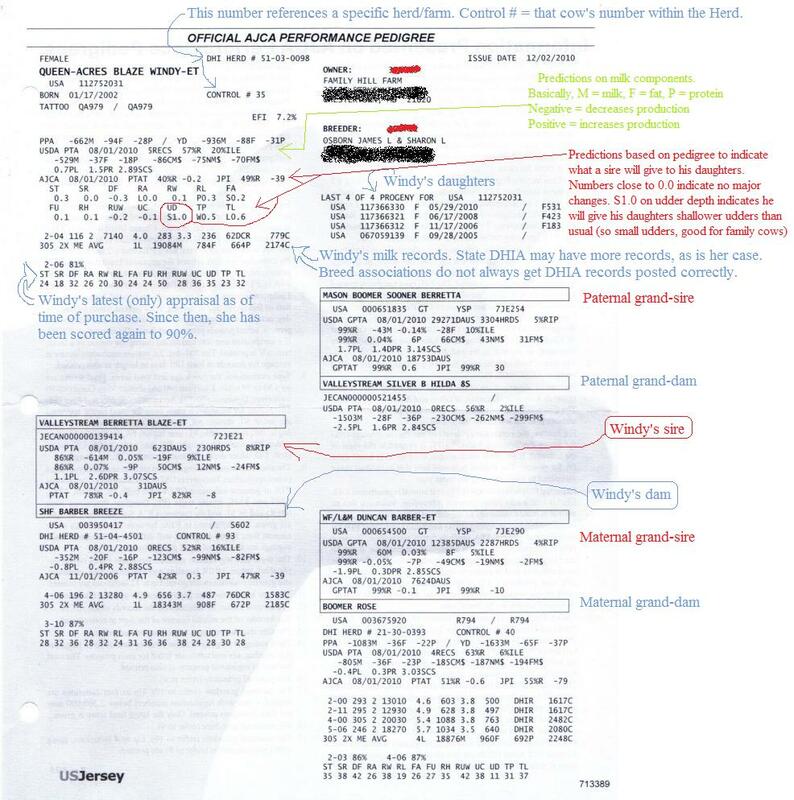 If your cow is confirmed pregnant at the time of sale, try to get the previous owner to put the sire information and breeding date on the paperwork. This will be very, very helpful if you end up with a heifer calf you need to register! ET = Blaze was also an ET, like his daughter. 72JE21 = His individual sire code. You can read up more on my breeding page: https://spiritedrose.wordpress.com/jersey-cattle/before-buying/ai-and-breeding/ OR check out NAAB again (see link above). Hopefully, the person selling you the animal will take care of the transfer of your cow. 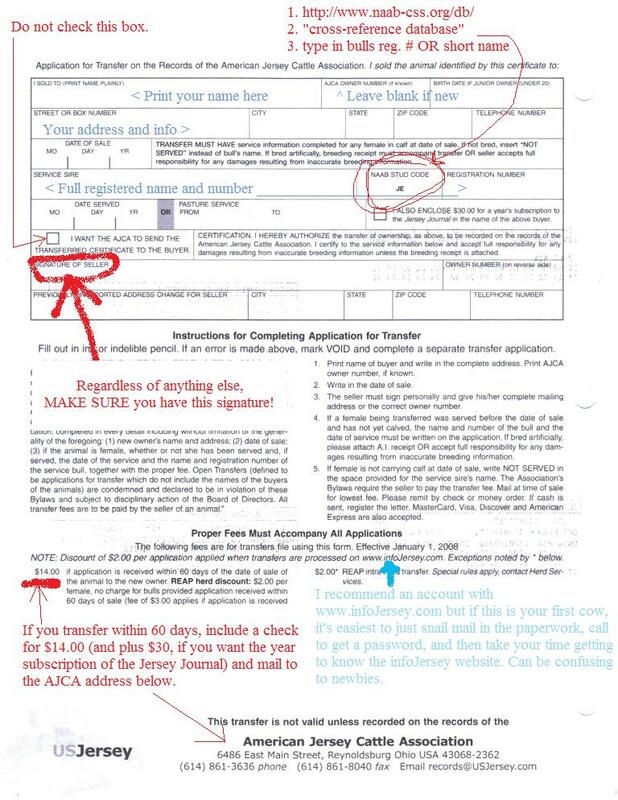 A seller is supposed to pay for the transfer fee, and their approval is required for transfer, so best to get either their signature on the back of the registration paper or confirmation they will submit the information online. Your website is so awesome! I have just started into milk cows and have chosen to go the registered route. I am also taking an AI course this year. My family is full of men that raise beef cows, so this is foreign language to them (they are no help haha). Without your website I would be searching online for hours. Thank you so very much for providing all of this information and taking the time to teach in a manner that is easy to understand. I can’t wait to start breeding my girls to work toward herd improvements!! I’ve caught the Jersey bug. lol And your site has helped to point me in the right direction. Glad to hear! AI is a quick way to improve your herd and it’s so exciting when you get high quality heifer calves!! Good luck!